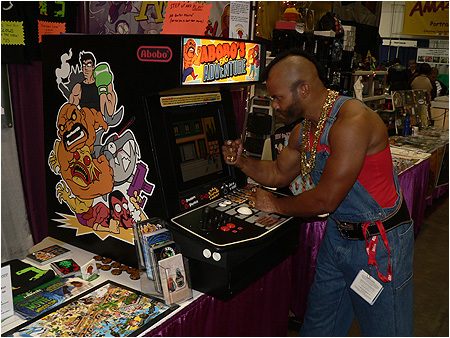 I Pity The Fool Who Don’t Come Play Abobo’s Big Adventure! REMINDER: For those of you attending Comic-Con, I-Mockery is located in Row 300, Booth #A10 (located towards the back near the lounge area). Yo ho ho! It's been insanely busy this year at Comic-Con, and that's probably because all the other guys weren't able to come this year and help out at the booth. As a result, I've been on duty since the convention started and haven't had much time to walk around yet... and today's the biggest day of the convention! Fortunately, I'll have some extra help on hand today and will do my best to walk around and take some pics for you guys whenever I have a chance. Looking forward to seeing all the crazy costumes once again. I mean, just look at that Mr. T guy. That thing is dead on! In the meantime, check out this super nice review on Destructoid that they just posted about our upcoming game, Abobo's Big Adventure. Lots o' details on the game and impressions of it so far. Anywho, I've gotta head over to the convention now, so I'll talk to you guys later on. By the way, given that the arcade cabinet actually has two joysticks and sets of buttons, is Abobo's Big Adventure a game for two players, either by turn or simultaneous? Argh, now I hate myself for living in Singapore and not being able to go to the Comic Con. When will Abobo's big adventure be put up on the web, man? Julio: Just going by pure speculation here, but my guess would be no. I'm ashamed of your Rog.... that's a store bought cabinet! The fact that it has waaaaaay too many buttons for any real arcade game (used by companies as bait to lure dumb noobs into buying it for use on -- blah! -- modern console games) and two sets of pinball buttons is a dead give away. The artwork looks really nice, but seriously... never heard of byoac? klov? I thought that was actually Mr. T for a second! Julio - We made a fun little two-player battle mode where you and a friend can fight each other as Abobo on a variety of back drops. But the main large game is just single player. Howard - Haha, you're taking it too seriously and you're incorrect... that cabinet was built from scratch. The specs were drawn up, then the wood was cut and painted, lights installed for the marquee, labels applied, etc etc. The control panel is the only thing that was purchased and it was for good reasons: it was selected because a) the trackball is used as a mouse in windows to easily boot up our game, b) the side buttons are assigned as left & right clicks, c) we needed something that could be torn down completely for transport to and from comic-con without removing a ton of wires d) it's being used as a MAME cabinet as well when it's not at Comic-Con. Hey RoG once again it was great seein ya this year at Comic Con. I can't wait to play again. Kicking the little girls head off and eating it for health. Just hilarious. Bonus for using her body as a bomb. Looking forward to the full version. Hey guys, loved the game! Can't wait for full version! Thanks for the Zombie Michael Jackson Thriller shirt! Hey RoG quick question. Does Soda Popinski or Count Pop show up as bosses in Abobo’s Big Adventure??? I'd really like to go to Comic Con one year too, but I live in Canada and likely won't have the $$$ for some time. Hope thing went well RoG! Missing very much the digging of the scene. Owe you a letter big time, friend. The mini cab is awesome! Glad to see that. Beardy Barrel shall taste his demise when the full game is released. Oh yes. I'm so glad I finally found the booth!! (not that you'd remember, but I was the girl with the green goggles who stopped by on Saturday) I got TONS of compliments on my pickle hat afterwards. :) The Dinosaurs Attack cards are getting pinned up around my office to see how many coworkers I can freak out. Was awesome to finally meet you, thanks for the picklehat too - it hasn't broken yet suprisingly! Just for reference i was the guy quoting 'Roger Barr meets Tom Fulp' haha. I found the movie to be pure enjoyment and am so glad I went. All of the main characters were great fun to watch and it was actually exciting to see some of the ones whom I've not seen in a movie in a long time. Previous post: I-Mockery At The 2010 San Diego Comic-Con: Preview Night! Next post: San Diego Comic-Con Recovery.